Are you looking for great savings for a front wood door? 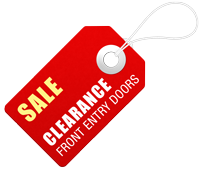 We offer clearance prices for front wood doors which can be shipped to you quickly. These great bargains / closeout doors are discontinued models or surplus inventory looking for a loving home. There are limited quantities available of these clearance front wood doors. Sold "AS IS" without warranty. All sales final. We often have an eclectic assortment of odds and ends on hand. These items may be old acquisitions, scratch and/or dents, display or discontinued models, and surplus inventory looking for a loving home. Shop this in stock specials for quick delivery and/or great bargains. Sold “AS IS” without warranty. All sales final. We apologize for what may appear as lower quality images as this popular inventory continuously evolves.